The America's Cup is still very much up for grabs after a record-breaking 17 days of racing. 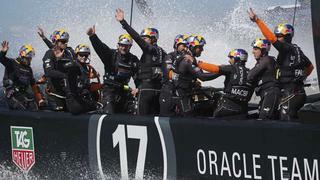 Team New Zealand continue to squander a seemingly unassailable lead, and yesterday Oracle Team USA took another step closer to pulling off the most amazing come-back in America's Cup history. In Monday's only race, Emirates Team New Zealand took an early lead, but were quickly overhauled by the Americans, who went on to win by 33 seconds. With three more races to go, Oracle Team USA has all the momentum, while Emirates Team New Zealand seem unable to anything to stop them. With the results now standing at 8-6 to the Kiwis, it's looking increasingly possible that this could come down to a winner-takes-all last race.